November 20th, 2015. Bandai has announced the next figure in their NXEDGE Style line of SD figures, NX-0014 Omegamon. 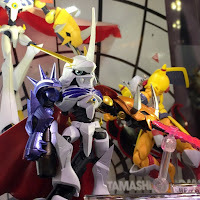 Scheduled to launch in April 2016, Omegamon comes with accompanying effect parts to simulate the blast and slash of the Garuru Cannon and Grey Sword. Omegamon is the first character in the NXEDGE Style line to not originate from a mecha franchise, being the only "Digimon Unit" as opposed to a Dynamic Unit (Mazinger Z), MS Unit (Mobile Suit Gundam), GGG Unit (The King of Braves GaoGaiGar), or KMF Unit (Code Geass). NXEDGE Style frequently features units that make it into the Super Robot Wars crossover series of video games, emulating the games' super deformed style.